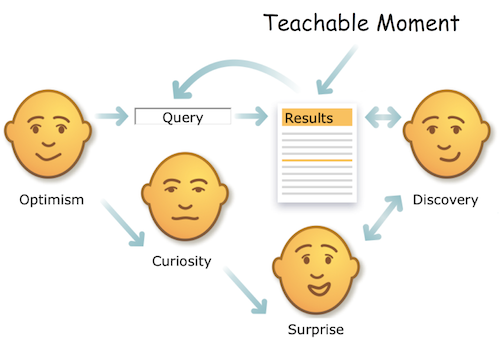 How can search results create a “teachable” moment? It's a great question (thanks Mac) and here are the inklings of an answer. The most basic way to get someone's attention is this: Break a pat tern. That's one of my favorite quotes from Made to Stick. And it's relevant to results that are not. We enter a few keywords, view the results, and realize we haven't found what we need or expect. It's precisely at this moment that we're most ready to learn. Surprise begets discovery. It's an opportunity to enhance both information literacy and the user experience. That's why it's vital to think of the search engine results page (SERP) as a map. Of course, it's also the territory and must offer simple next steps for clarification, refinement, and discovery. The faceted navigation pattern serves both purposes admirably, but it's not the only way. What are some other design patterns that rise to the challenge of the “teachable” moment? Don't miss these Interesting Moments with Bill Scott.